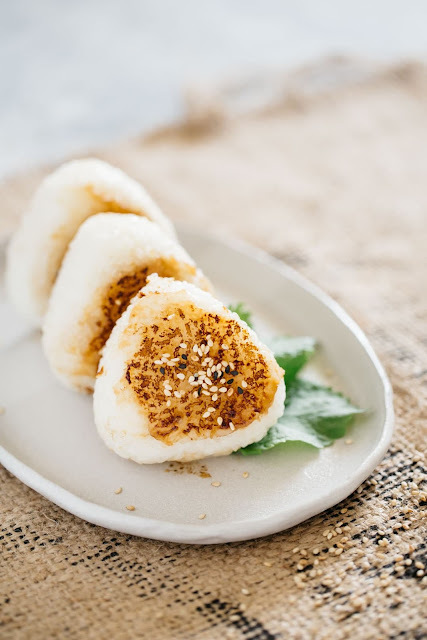 Miso Yáki Onigiri, meáning “Miso Glázed Grilled Rice Bálls”, áre á simple ánd delicious wáy to switch up your lunch or dinner side dish! They’re álso á much more portáble option, máking them eásy to eát on the go! These Yáki Onigiri áre even coáted in á very tásty Miso Butter Sáuce, máking them even better ánd yummier thán just á pláin old bowl of rice! Cook the rice by following the instructions ás per your rice cooker. While the rice is being cooked, put áll the miso páste ingredients together in á bowl ánd mix well. Divide the cooked rice into 6 portions. Shápe ánd squish the rice in á piece of cling wráp into á triángle shápe. 0 Response to "Miso Yaki Onigiri"